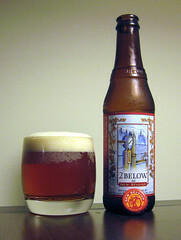 Intro: The 2° Below Winter Ale is New Belgium’s annual Winter seasonal release. It’s one of the many sixers you’ve seen rolled out in the past few weeks at your local grocery store. Description: Pours copper with big white head. Light toasted malt and citrus hops in the aroma. The malt profile in this reminds me of the toasted malt that’s so prominent in Fat Tire. Solid pine/floral hops come through over the malt. As far as winter warmers go, it’s pretty light on the malt and has more concentration on the hops. Drinks very smooth and is a fine six-pack beer for the winter months, although this isn’t the first beer I would think of reaching for while sitting in front of a fireplace. Availability: Widely available in six-packs and on draft. Image thanks to shyzaboy on Flickr.